Earning our JRPG black belt - Let's Play Legend of Legaia! I'd hire him. I don't even know what job opening I could possibly have, but I'd hire him. Poor Umber, he didn't quite do as well as everyone else. This in spite of being a fully-trained martial artist instead of a boy from a peaceful village or a girl who grew up in the mountains with only her ra-seru for company. Must be emasculating for him! I'm glad he can at least claim the title of "Least likely to die." Anyway, congrats on getting through the LP! It was good times. I'll be looking forward to the next one! I know I said it in the comments for the ending video, but you're welcome. And, thank you for doing this over these last few months. It's nice to finally have a complete Legend of Legaia LP on the Internet. I love that summary screen. More games should do something like that. I'm curious how the knockouts number is so low. Didn't you lose like a guy a round against the optional boss? I... don't remember a screen like that. Just press X a few seconds after the "The End" screen pops up. I did, yes, but I also kept two save-files: one where I fought Lapis normally, and one where I used Jedo to kill it instantly. The latter just happens to be the one I beat the game with. 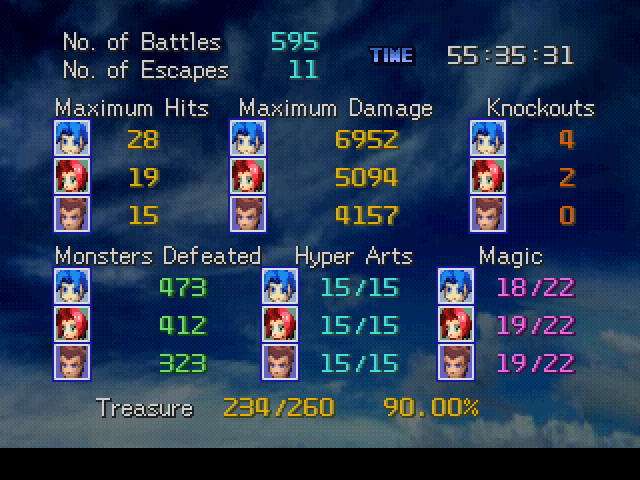 I could go back and use the other save-file if you're curious about those numbers. Impressive LP, and I really like how you wrapped it up at the end. Can't wait til the sequel! Thank you, Soren, for putting so much time and effort into something really awesome for us other nerds on the internet to enjoy. I eagerly await whatever you do next, whether it be Breath of Fire (another series I really loved), Legaia 2, or something else entirely. Thanks for LP'ing this. It's always a game that I considered a slog (and based on your videos, it looks like at the very least there's less room for error than I'm comfortable with), but the exhaustive detail you gave to it reminded me why I always found it so fascinating. Great work! Looking forward to your next LP. A few days ago, past contributor to this thread and all-around swell dude Kahran042 messaged me to let me know that the images for one of this thread's updates - specifically this one - no longer worked. This is because at the time, for whatever reason, my imgur account wasn't working, so I had to temporarily use photobucket. Not a big deal back then, but kind of annoying now, for obvious reasons. Anyway, I'm posting here to let any future readers of this thread know that the image links have been fixed and should work properly. Unfortunately, in fixing this problem I've discovered that, aside from the videos I recorded for this thread, all the other links - the chapter links in the first post, and all the music links in the entire thread - were broken as well. I've updated the chapter links, but going through the music links is going to take a lot longer. On top of being a time-consuming task to begin with, I'm a busy college student, so I don't know how long exactly it'll take to fix all the music links, but I'll do my best to get everything sorted in as timely a fashion as I can manage. After that's done I'll go through my other threads and salvage what I can there as well. To that end, if anybody finds a similar problem in one of my other threads before I'm finished updating everything here, let me know and I'll see what I can do. Thank you for your patience, and thanks for reading. ...While I'm here, I might as well talk about something that's been bugging me for a while. I'm not really happy with how this thread turned out, and I'm not just talking about all the broken links. I don't feel like I did a good job on this LP at all. I didn't really do justice to the game; more importantly, I didn't do justice to my memory of this game. Let me try and elaborate. This LP, as it stands now, is a straightforward, informative presentation of Legend of Legaia, with some jokes of varying quality peppered throughout. Which is fine, I guess, but this game means a lot more to me than that. When I played it for the first time as a kid it hit me in the same way that Chrono Trigger or Final Fantasy VI hit other people. It had a profound influence on me in ways that I'm still feeling to this day. But I didn't really show any of that in this thread. I didn't talk about how this game's combat showed me that turn-based battles could be exciting and visceral when the only reference point I had at the time was Pokémon Yellow. I didn't talk about Michiru Oshima's work on the soundtrack - how it used simple melodies and harmonies juxtaposed against complex, multi-layered percussion for dramatic emotional effect, or how it still influences how I write my own music. I didn't talk about how the dated, chunky graphics could at times be more expressive than its big-budget contemporaries. I didn't talk about how, for all the goofiness and awkward lines there were in the translation, it was still an incredibly earnest game full of heart. I just presented the game as-is and let people draw their own conclusions, with no personal input at all. And that bugs the hell out of me. Whenever I look back on this thread I feel like I did everybody who read it back when I was still making updates, or whoever reads it in the future, a disservice. I'm not saying this game is perfect - I'll be the first to admit that it has some glaring problems - but I can't help but feel like I failed it somehow. Because this game doesn't get a lot of discussion to begin with; most of the time if someone has even heard of it, their reaction is either "Yeah it's a game that exists I guess" or "eh, not that great, there's better stuff out there". I'm not trying to disparage anybody who has these opinions, don't get me wrong - I'm just saying that, except for a wiki (because everything has a wiki), this game doesn't have a community in the same way that the heavy-hitter JRPG series do, or even B-tier series like Shadow Hearts (or Wild Arms!). I could have contributed something to that. But I didn't. I just put words and pictures in this thread in sequential order. I understand why this thread turned out the way it did, though. Part of it is just simply my being inexperienced at the time. This was my first big LP, my first big game to cover, and it was a little overwhelming. I tried to show absolutely everything that I could, and in doing so I made some amateur mistakes. I used way too many screenshots for basically every event in the game, major or minor, when just a few (or a gif) would have gotten the point across. I didn't know how to make gifs, so I recorded a ton of short unnecessary videos, when even a few compilation videos would have served the same purpose. Video editing of the longer boss fights was entirely nonexistant, which I'm sure made watching them a slog. I also wasn't really functioning at 100%. I don't know if I've talked about this before (either here or in some other thread), but at the time I was updating this LP I was suffering from pretty serious depression; I was basically a wreck. As odd as this might sound, making LPs was sort of therapeutic in its own way. It let me focus on the relative tedium of typing out dialogue into a Word document or editing screenshots instead of how much I hated myself, or how I otherwise hardly felt anything at all besides crushing apathy. I'm doing a lot better now - I haven't had a serious episode in a long time, and I'm honestly very happy with how my life is going right now. And I'm really glad I'm not in that dark place anymore. I feel like I should clarify: I'm not trying to blame all my problems on my own past mental illness, and I'm certainly not trying to stigmatize it. If it comes across that way I sincerely apologize. I just feel like it's important that I elaborate on the thought processes and feelings I was having at the time. In any case, for all I've said, I can't just go back and redo this thread. Even if I could, I just don't have the time right now, and I don't know that anybody would be interested. I have to let sleeping dogs lie. Or threads, as it were. If you've somehow had the patience to read all that, thanks for sticking around and reading my ramblings. As much as I feel hesitant to call my efforts here worthwhile, I do still appreciate everybody that takes (and has taken) the time to read this thread, warts and all. I guess I don't think this thread is completely terrible; if I did I don't think I would care enough to fix any of these broken links at all. Anyway, that's all I've got for now. I want to jump back into making more LPs at some point, but that requires more time than I'll have for the foreseeable future. There's also the problem of technical difficulties - my ideas for future threads would require me to both actually buckle down and learn how to make gifs, and buy a capture card to record footage, which is expensive. But I hope that, when all that finally happens, somebody out there will enjoy what I have to offer. Thanks for reading, everybody. It means a lot. Last edited by Soren Highwind; 02-04-2018 at 11:02 PM. For the record, Soren, I thought this was an awesome LP, and far bigger and longer than anything I've been willing to attempt. It's great when something meets our own super-high expectations, but "not quite what I hoped for" is often still "really good" to the viewers. If there's one thing I've learned from writing at all, it's that you write what you write when you write it, and that act is inseparable from the person you are when you write what you write. ... Right? In all seriousness, I enjoyed this LP. Were there things that could be changed? Of course. But if you waited until you thought you could truly do LoL justice, the LP might never have been written at all. And that would be a loss for the boards and the game you've always enjoyed. And, for the record, once again, I thought this was a great LP, and as someone else that enjoys these niche PSX JRPGs (obviously including LoL, I did post in this thread about time travel hijinks once), I thought this was a great tribute to the title.